There’s plenty to do within Denver city limits, but the Mile-High City has long been known as a springboard for other nearby trips. While some cities may have one or two nearby day-trips, Denver is next to the Rocky Mountains, fascinating museums, interesting stops, and other charming mountain towns you’ll want to check out. Denver’s location near the north-central part of the state sets you up for many great day trips depending on you and your groups’ preference. You can move north towards Fort Collins, south towards Colorado Springs and Pike’s Peak, or west to all the outdoor fun and recreation the Centennial State has to offer. While most people set their sights west of the city, Colorado has many more options near Denver that can be seen and experienced in one day. Here's our list of ten of the best unique day-trips from Denver including what you can do there, how to get there, and any pertinent travel tips. There’s a ton to do within Denver but try out these different day trips for an unforgettable visit. Boulder, Colorado is home to the University of Colorado at Boulder, Pearl Street Mall, and the Flatirons of the Rocky Mountains. Boulder is one of those charming towns you can quickly get lost in with all the different shops, restaurants, and plenty of ‘honey look at that!’ moments. Tourists can spend all day on Pearl Street shopping at the many unique shops, trying out desserts and coffee, clapping for street performers, or taking part in some of the world’s best people watching thanks to Boulder’s colorful cast of characters. You can get outside in nearby Boulder Creek and the many miles of trail around the Flatirons. Getting There: Boulder is found roughly thirty miles northwest of Denver along Colorado State Highway 36. Many Denver thoroughfares including Interstate 25 connect to Highway 36. Expect a drive of 30 minutes to an hour depending on your starting location and traffic. Travel Tip: Don’t try to find free parking and don’t scrounge for a metered space you have to visit every couple of hours. Park in an all-day garage near Pearl Street Mall for protected parking you don’t have to worry about. Golden, Colorado is home to the Colorado School of Mines, The Coors Brewery, and several outdoor activities that make it an excellent destination for a day trip. If you’re into history, how things work, or want indoor activities, you can try touring the Coors brewery, spend some time at the Colorado Western Railroad Museum, or sample of one of many local brews. There are several miles of great hiking and biking trails around Golden. Getting There: Golden is directly west about a half hour from Denver along US Highway 6. Travel Tip: The Coors Brewery is the most popular activity in Golden so expect long lines on nice days. Fort Collins is home to Colorado State University, and though Fort Collins doesn’t provide as many unique sights and sounds as Boulder, it is still a great college town worthy of a day trip from Denver. Fort Collins has many unique independently-owned shops and restaurants that appeal to all tastes in addition to adventure around nearby Horsetooth Mountain. Hot-spots in Fort Collins include New Belgium Brewing, Odell Brewing Company, the Fort Collins Museum of Discovery, and the Totally 80’s Pizza and Museum for a blast of nostalgia. Getting There: Set your sights north and head up Interstate 25 to get to Fort Collins. A trip from Denver to Fort Collins takes approximately an hour and a half in normal traffic conditions. Travel Tip: Fort Collins is much more suitable for visiting during the summer. Many students leave Fort Collins during summer leading to more elbow room along the trails and for dinner reservations. Try early summer for the smallest crowds. Garden of the Gods is a unique National Natural Landmark found in Colorado Springs, CO. Visitors can see millions of years of geologic activity that have uprooted the ancestral Rocky Mountains and sent them thrusting towards the sky. The formations are surrounded by Garden of the Gods Park which includes hiking and biking trails, climbing routes, and a visitor center to learn the history of the formations and much more. Getting There: You can visit Garden of the Gods Park by way of Interstate 25 south. The drive takes approximately an hour and a half to two hours dependent on local conditions. Travel Tip: Garden of the Gods is open until 11 p.m. May through October so take your time with sights. Garden of the Gods takes on a different beauty at night so see it during the day and the twilight for a complete trip. Pike’s Peak is one of Colorado’s most famous ‘14ers,’ or a peak that exceeds 14,000 feet. Colorado may be home to over fifty 14ers, but Pike’s Peak is special — you can drive up it! During the summer visitors can drive from the base to a lot only a few feet from Pike’s Peak’s summit. There are few places in the world where you can drive your vehicle directly to one of the country’s best views. Getting There: Pikes Peak is found in Colorado Springs, which is an hour and a half from Denver by way of Interstate 25 south. Travel Tip: The road to Pike’s Peak Summit closes seasonally and dependent on weather. Always check road conditions before driving down. Mount Evans is another 14,000+ foot peak found within a short drive of Denver. During the summer visitors can drive all the way up to the summit similarly to Pike’s Peak by means of the Mount Evans Scenic Byway. As the name implies, there are plenty of great views all the way to the top. Like Pike’s Peak the view from the summit of Mount Evans is difficult to beat not just in the US but across the world. The Mount Evans Scenic Byway is open seasonally from approximately May to September. Getting There: Mount Evans lies west of Denver and like most adventures on our list, can be enjoyed by way of Interstate 70. Most journeys to Mount Evans take about an hour and a half to two hours. Travel Tip: Mount Evans is very popular during the summer, get there early for an easier drive and better views. There are too many individual resort towns and skiing destinations to include all of them in this article, so we’ll use the activity of skiing and snowboarding as one day trip. Popular ski and snowboard destinations within a day-trip distance of Denver include Beaver Creek, Copper Mountain, Breckenridge Resort, Winter Park, Vail Resort, and many more. Ski season in Colorado runs approximately from November to April. Getting There: Most ski and snowboard destinations are found along or directly off Interstate 70 west. Drive times can last anywhere from an hour and a half to more local resorts like Winter Park and Keystone Basin to three and even four hours for Breckenridge or others depending on I-70 traffic and weather conditions. Travel Tip: Always check traffic conditions before hitting the interstate. Interstate 70 mentioned above is notorious for closures, slick conditions, and hours of traffic during ski season. Police also enforce traction laws during adverse conditions so you could be turned away if your vehicle isn’t suitable for the drive. Like skiing and snowboarding, there are too many individual destinations to list all day hiking possibilities from Denver. The most popular hiking spots include the foothills of Morrison, CO, Pike National Forest, White River National Forest, and hundreds of miles of county, state, and federally-owned and managed hiking trails. It’s helpful to decide on the qualities of your hike like distance, how far you want to drive, difficulty, and what you want to see instead of blindly choosing trails. Getting There: Denver day hikes are found anywhere from a few miles to a couple hundred miles outside of the city. The most popular destinations are accessible by Colorado Highway 285 south, Colorado Highway 470, and of course, Interstate 70 west. Travel Tip: All routes to and from the mountains will choke during the weekend. Leave early and be prepared for gridlock. If you like the idea of Vegas in the mountains visit Black Hawk or Central City. Black Hawk and Central City are former mining towns that have been repurposed into entertainment centers with gambling, great eating, live music, and much more. If you want to turn your day trip into an overnight, there are plenty of great casino and hotel options like Century Casino in Central City or Ameristar Casino in Black Hawk. Getting There: The main route from Denver to the ‘gambling towns’ involves Interstate 70 west to Central City Parkway. DO NOT take Virginia Canyon Rd even if recommended by navigation software. Virginia Canyon Rd is more locally known as ‘Oh My God Rd’ for its lack of barriers and real pavement. The drive can take approximately one to two hours depending on traffic and weather conditions. Travel Tip: You can take a shuttle to the casinos directly from Denver if you would rather not drive. There is a charge for shuttles. Rocky Mountain National Park (RMNP) is the place to visit if you want gorgeous mountain views, miles of untouched Colorado wilderness, and wildlife spotting. There are many activities at RMNP including hiking, biking, great miles of roads if you prefer cruising, and several other outdoor-related adventures. Estes Park, the closest town to RMNP, is home to unique shops and restaurants including Snowy Peaks Winery, Mountain Blown Glass, and the Aspen and Evergreen Gallery. Getting There: You can get to RMNP from Denver by US Highway 36 West. Driving to RMNP takes approximately one and a half to two and a half hours depending on traffic and water conditions. Travel Tip: RMNP is packed during the summer. If you don’t leave early (before 7 am) expect to get stuck in traffic. There’s a lot to do in Denver, but there are more great day trips scattered around the Mile-High City to make it one of the best day-trip destinations in the country. 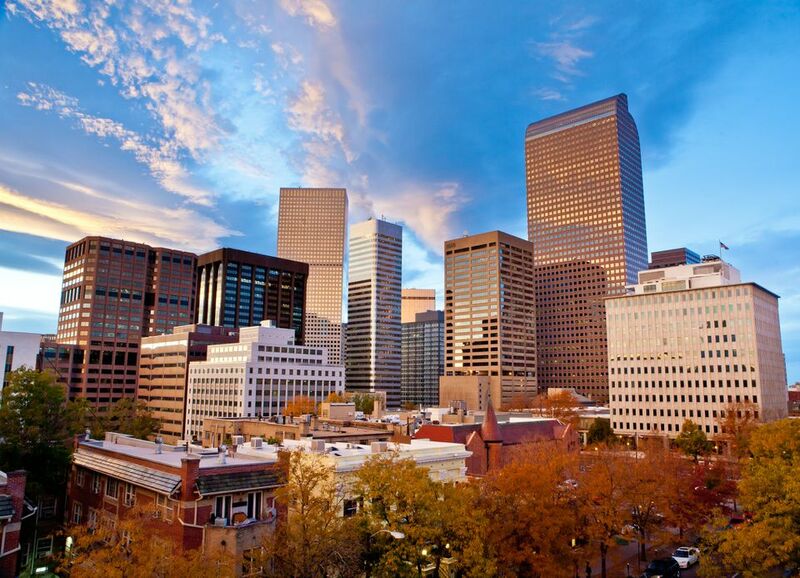 Talk with your family and traveling partners and review our list to book the best Denver trip for yourself.